Sometimes, life gets in the way of beauty. You go out in the sun, and sun spots appear in a spray just under your eyes. You work too late one night, and there are dark circles under your eyes. You age, because you don’t have a choice and your skin looks darker in general. While you can’t help these situations, the unfortunate fact is that they show every time you look in a mirror. In order to treat this, you need a high tech product like Transformulas Eye Lightening Serum. 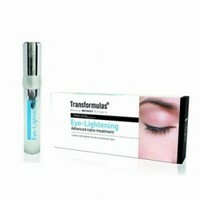 Transformulas Eye Lightening Serum is a serum which works by utilizing state of the art nanotechnology to penetrate the skin and release much-needed nutrients that brighten and lighten the complexion of the skin around the eyes. The nanotech reboots collagen production, so that skin cells are fuller, less wrinkled, and stronger. It also helps prevent capillaries from breaking across the surface of your face and promotes healthy skin in general. The total effect is an overall cleaner, lighter eye look. The product is complimentary to all skin types and takes only a brief moment to rub in, using the applicator brush provided. If you have any questions or concerns, please refer to the official Transformulas Eye Lightening Serum website, or contact the merchant directly. Only comment below if you have used Transformulas Eye Lightening Serum before and you would like to share your experience. Don't forget to use the star rating system.